Campaign Manager needs to be installed on a computer running Windows. 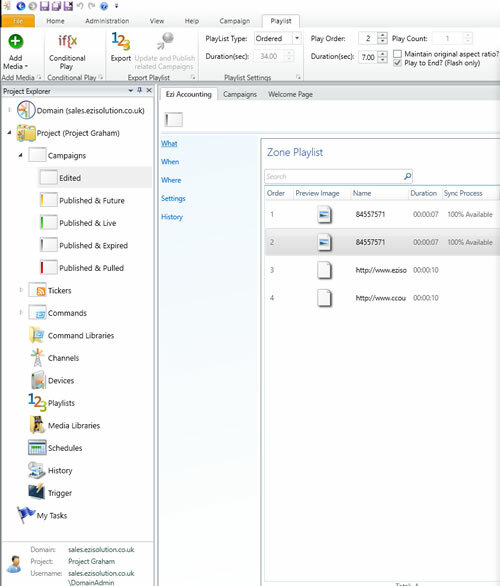 This is used to create the campaigns that will be run on the Media Players, on computers running Windows or Android. Use of CM Cloud is recommended for reliability and ease of use. An Internet connections is only required when updating and publishing campaigns. CM Local can be used where customers prefer to use locally installed software. A login is required to the Cloud based server before campaigns can be create. The download for Campaign Manager and login to the Clould are provided as part of the demo evaluation. A campaign consists of Media, a Schedule and Destination(s). This equates to What, When, Where. Each Media Player can be assoicated with more than one Campaign. These allows flexibility, so campaigns can be run based on a schedule of days of the week or time of day. Campaigns can overlap or can be scheduled to run one at a time. The Media Player can run on Windows or Android. Campaign Manager allows each Campaign to be created with diverse media such as images, videos, live web sites or live TV. 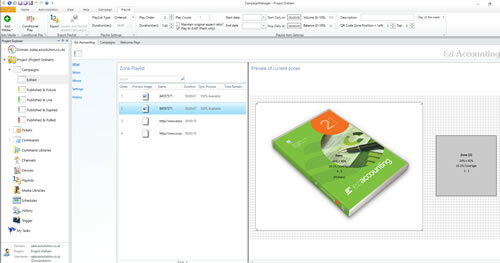 Use of split screens allows media to be displayed in parallel. The Playlist specifies how long each component is played for. Components can be repeated as many times as required. This can be used to create campaigns that have repeated and varied information. to attract the attention of the viewing public. The Devices screen shows the status of each Media Player. 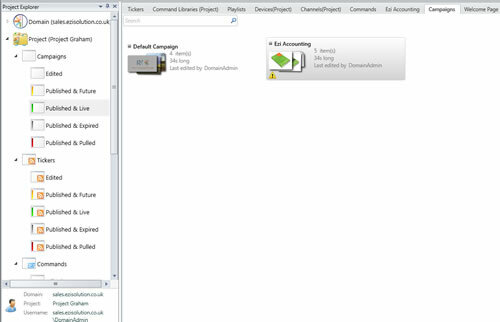 Campaigns can be published to Media Players individually or in groups.